We LOVE birthday cake at this home!Like I stated earlier this week, you will get a couple “cake recipes from my daughters birthday. I love finding recipes involving cake flavor. Check out my CAKE BATTER PANCAKES if you haven’t already! You will love them! I saw this recipe going around Pinterest from Girl Meets Life and decided to finally make them for the birthday party. Direct Quote from my hubby, “I could eat these everyday and never get sick of them!” I take that as a complete success and definitely a recipe we will make again!Try them out and see for yourselves! Add the milk slowly – you want the batter to remain as dense as possible so they are more of a “blondie” and not a cake. 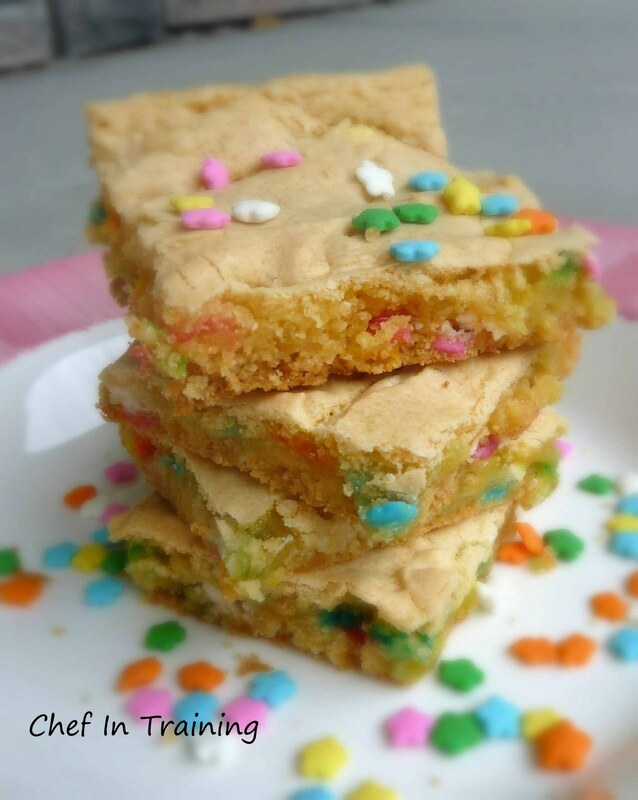 Mix in the rainbow sprinkles and white chocolate chips. These look great! I love the colors! Pinning them now! I might make these today, I actually have all the ingredients in the pantry! I think my husband could probably live on these too! He would probably appreciate some frosting on top, but he is greedy! They look delicious! These look so good and easy. Would love for you to share at bacon time. Linky start friday. Just found you from pintrest. I want to make everything you've posted! Were the ones in the picture baked in a larger pan - maybe 9x13? Mine turne dout very yummy, but much higher than these. Any idea of baking time for a 9x13? Mine turned out tall, as well, and cakey. Tasty, but not at all a blondie. I'll try with a 9x13, if I make them again. I've made these twice now and they're soooo yummy and easy to do. I love them even more than brownies!